If you are a music fan, you should have already hear about the words like "lossless", "lossy", "bitrate" etc. But do you know exactly what they mean? Are there big quality difference between low bitrate and high bitrate songs? 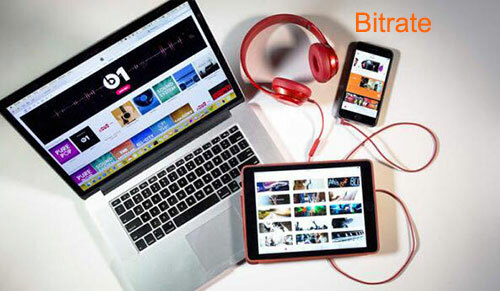 Generally speaking, bitrate refers to the amount of data that are processed over a certain amount of time. In audio industry, this is known as kilobits per second. "Lossless" means there is no data lost during encoding. The original waveform file from CD is thought as "lossless" and it has a large size. To make it easier for distribution, some lossy formats MP3, AAC, OGG are introduced for online streaming. Today I'd glad to share some details about the Apple Music bitrate and how to improve it. Nowadays many streaming services online have 320Kbps bitrate like Spotify, Amazon Unlimited, Google Play. Some even has lossless quality such as Tidal. So what bitrate does Apple Music stream at? Apple Music seems an exception. It has only 256Kbps bitrate. That is a bit lower than the mainstream music platforms in the market? Does it mean Apple Music fall behind in terms of the music quality? Definitely not. Besides the bitrate, there are many factors sample rate, codec, format will affect the quality. Apple Music is encoded in AAC codec which have better quality compared to the same bitrate files in other formats MP3, OGG. Actually	a survey online shows most	music users can't distinguish the quality difference between Spotify and Apple Music. Besides, this has pretty much to do with the playback devices. Personally I found Apple Music plays more smoothly and the melody is even more natural. 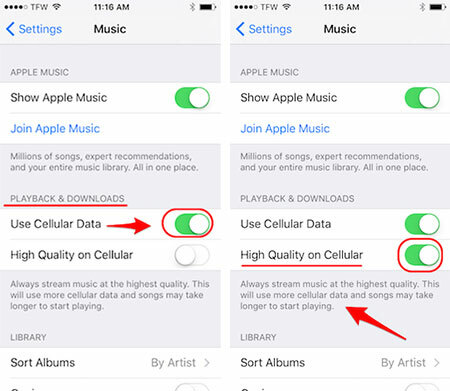 Some users many find that the Apple Music may stutter if they are using the cellular data instead of Wifi on their mobile phones. Well, this is because Apple Music will automatically reduce the bitrate on mobile phones when using cellular data. Is there a way to change it? 1. For iOS devices, tap "Music" > "Mobile Data". Then switch the toggle buttons “Use Cellular Data", "High Quality on Cellular" on. 2. For Android users, tap the top left menu > "Settings", find and enable the "high quality streaming option" under "Playback". Apple Music is in AAC format with 256Kbps. It is good for average listeners. But what if you want 320Kbps MP3 songs? Or even the lossless FLAC or WAV music? Take it easy. You can also use third party music converter to help you edit and encode the Apple Music bitrate to the one you want. 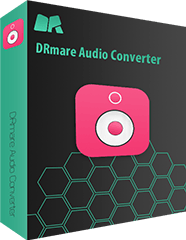 DRmare Audio Format Converter for Mac/Windows is designed to convert convert DRM music files. Such as Apple Music, iTunes songs, Audible audiobooks and much more. It combines the features to change the audio file codec, format and adjust the parameters in an easy-to-use interface. Step 1. Import your downloaded 256Kbps bitrate M4P songs to the DRmare software main screen. Step 2. Choose the output format as "MP3" and set the bitrate as "320Kbps". If you want lossless format, you just need to choose "FLAC" or "WAV". Step 3. Click "Convert" button to remove DRM and convert Apple Music to the higher quality songs.